As a matter of degree, the Courts tend to attach greater weight to their own previous decisions than to the views of text writers. A judicial precedent speaks with authority. It is an evidence of law and source of it. The authority of precedents is great because of power, skill and professional reputation of judges who make them. Judicial precedent means the process whereby judges follow previously decided cases where the facts are of sufficient similarity. The doctrine of judicial precedent involves an application of the principle of stare decisis, which is Latin for "let the decision stand" i.e. to stand by the decided. In practice, this means that inferior courts are bound to apply the legal principles set down by superior courts in earlier cases. Judge made law via the cases upon which they decide is one of the oldest sources of law. This provides in the law consistency and predictability. Judicial precedent means a judgment of a court of law cited as an authority for deciding a similar set of facts; a case which serves as authority for the legal principle embodied in its decision. 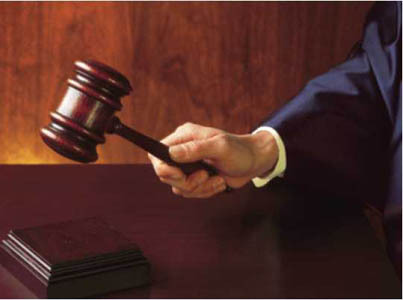 A judicial precedent is a decision of the court used as a source for future decision making. The phrase doctrine of precedent has two meanings; the phrase means merely that precedents are reported may be cited and will be followed by the courts. In the second, the strict meaning, the phrase means that precedents not only have great authority but must ( in certain circumstances) be followed. The practice of citing cases and of attaching weight to them is necessary to secure the certainty of law. The doctrine of judicial precedents broadly speaking implies that court is bound to follow decisions of its higher courts but may not be bound by decisions of courts of co-ordinate jurisdiction. A ruling of a superior court is a binding law. It is not of scriptural sanctity but is of ratio-wise luminosity within the edifice of facts where the judicial lamp plays the legal flame. Beyond those walls and de hors the milieu eternal vernal value to the decision, exalting the doctrine of precedents into a prison-house of bigotry, regardless of varying circumstances and myriad developments can not be imparted. Realism dictates that a judgment has to be read, subject to the facts directly presented for consideration and not affecting those matters which may lurk in the record. The law laid down by Supreme Court of India is binding upon all courts in the country under Article 141 of the Constitution, and numerous cases all over the country are decided in accordance with the view taken by Supreme Court. Judicial decisions may be distinguished as authoritative and persuasive. An authoritative precedent is one which judges must follow whether they approve of it or not. A persuasive precedent is one which the judges are under no obligation to follow and which they will take into consideration and to which they will attach such weight as it seem to them to deserve. Authoritative precedent are legal sources of law, while persuasive precedents are merely historical. Foreign judgments and obiter dicta are not binding upon courts, however they have persuasive value. Decisions of English courts lower in the hierarchy. For example, the House of Lords may follow a Court of Appeal decision, and the Court of appeal may follow a High Court decision, although not strictly bound to do so. In India Supreme Court may follow judgments of High Courts and High Courts may follow judgments of other High Court. The English decisions referred to by Supreme Court are of courts of a country from which India has derived its jurisprudence and large part of Indian laws and in which the judgments were delivered by Judges held in high repute. Undoubtedly, none of these decisions are binding upon Supreme Court but they are authorities of high persuasive value to which Courts may legitimately turn for assistance. Whether the rule laid down in any of these cases can be applied by Courts must, however, be judged in the context of Indian own laws and legal procedure and the practical realities of litigation in India. Forasol v. Oil and Natural Gas Commission, AIR 1984 SC 241; 1984 Supp. SCC 263. The Supreme Court is not bound by the dicta and authority of English cases. Supreme Court although can be guided by English judgement but can not ignore the rulings of Supreme Court itself. Samant N. Balakrishna, etc. v. George Fernandez and others etc. AIR 1969 SC 1201; 1969(3) SCC 238. The Courts have to evolve new principles and lay down new norms which would adequately deal with the new problems which arise in a highly industrialized economy. Courts can not allow its judicial thinking to be constricted by reference to the law as it prevails in England or for the matter of that in any other foreign country. Indian Courts no longer need the crutches of a foreign legal order. Indian courts have to build up their own jurisprudence. M.C. Mehta and another v. Union of India and others, AIR 1987 SC 1086: 1987(1) SCC 395:Forasol v. Oil and Natural Gas Commission, AIR 1984 SC 241; 1984 Supp. SCC 263. American cases relating to American constitution cannot be relied for the purpose of examining fundamental right under Indian Constitution because of difference of social conditions and habits of people of both the countries. Pathumma and others v. State of Kerala and others, AIR 1978 SC 771, 1978(2) SCC 1. Decisions of Privy Council or Federal Court are not binding on Supreme Court. State of Bihar v. Abdul Majid, AIR 1954 SC 245. The judge may go on to speculate about what his decision would or might have been if the facts of the case had been different. This is an orbiter dictum. The binding part of a judicial decision is the ratio decidendi. An obiter dictum is not binding in later cases because it was not strictly relevant to the matter in issue in the original case. However, an obiter dictum may be of persuasive (as opposed to binding) authority in later cases. Where there is no direct authority in the form of decided cases, persuasive authority may be found in legal writings in textbooks and periodicals. In modern times many authors have been cited frequently in court, both by counsel and by judges in judgments. Courts can use their discretion only when there is no declared principle to be found, no rule and no authority. The judicial decorum and legal propriety demand that where a learned single Judge or a Division Bench does not agree with the decision of a Bench of co-ordinate jurisdiction, the matter shall be referred to a larger Bench. It is a subversion of judicial process not to follow this procedure. The judicial review is the duty of judges of superior courts and tribunals to make the law more predictable. The question of law directly arising in the case should not be dealt with apologetic approaches. The law must be made more effective as a guide to behavior. Sundarjas Kanyalal Bhathija and others v. The Collector, Thane, Maharashtra and others. AIR 1990 SC 261; 1989(3) SCC 396. As regards the question of punishment, what is awarded in one matter cannot be the guiding factor for punishment in another. Murray & Co. vs. Ashok Kumar Newatia and another, AIR 2000 SC 833; ;2000(2) SCC 367. Whether a Division Bench decision is given in an appeal from an original suit or in a writ petition the ratio is binding on the subsequent Division Bench, and merely because the previous Division Bench judgment was given in a suit the subsequent Division Bench cannot refuse to follow the same because it was hearing the proceeding in a writ petition. The rule of judicial precedent is a very salutary one and is aimed at achieving finality and homogeneity of judgments. Ram Jivan v. Smt. Phoola (dead) by L.Rs. and others, AIR 1976 SC 844; 1976(1) SCC 852 . Precedents which enunciate rules of law form the foundation of administration of justice. It has been held time and again that a single Judge of a High Court is ordinarily bound to accept as correct judgments of Courts of co-ordinate jurisdiction and of Division Benches and of the Full Benches of his Court and of Apex Court. The reason of the rule, which makes a precedent binding lies in the desire to secure uniformity and certainty in the law. Tribhovandas Purshottamdas Thakkar v. Ratilal Motilal Patel and others, AIR 1968 SC 372;70 Bom LR 73. It is improper to overlook the opposing point of view even if it is expressed in minority judgment. Deena alias Deen Dayal and others etc. v. Union of India and others etc., AIR 1983 SC 1155; 1983(4) SCC 645. A precedent may be binding to one court but may be persuasive to other court. Two courts of equal authority have power to overrule each others decision . Where a precedent is merely not followed the result is not that the later authority is substituted for the earlier, but that the two stand by each other conflicting with each other. It is for the higher court which will in due time decide between the competing precedents, formally overruling one of them and sanctioning the other as good law. In the mean time matters remains at large ad the law uncertain. When the High Courts have expressed different views one time or the other it would be singularly inappropriate to invoke the doctrine of stare decisis in a case of this kind where High Courts have differed and the matter has been brought to Supreme Court for resolving the said difference of opinion, and it is duty of the Apex Court, to construe the relevant clause and decide which of the two conflicting views should thereafter prevail. Therefore the argument based on the practice prevailing in the majority of the High Courts in this country can not be of much assistance. Tirumalachetti Rajaram v. Tirumalachetti Radha- krishnayya Chetty and others, AIR 1961 SC 1795. A decision which has held field for a long time should not be disturbed in public interest. India Electric Works Ltd. v. James Mantosh and another, AIR 1971 SC 2313;, 1971(1) SCC 24. The decision holding the key for number of years but when the decision is plainly wrong and discloses the weakness in the reasoning, it is duty of the Court to overrule it. M/s. Jetha Bai & Sons, Jew Town, Cochin. etc. etc. v. M/s. Sunderdas Rathenai etc., AIR 1988 SC 812; 1988(1) SCC 722. It is neither desirable nor permissible to pick out a word or a sentence from the judgment of this Court, divorced from the context of the question under consideration and treat it to be the complete `law' declared by the Court. The judgment must be read as a whole and the observations from the judgment have to be considered in the light of the questions which were before the Court. A decision of this Court takes its colour from the questions involved in the case in which it is rendered and while applying the decision a later case, the courts must carefully try to ascertain the true principle laid down by the decision of this Court and not to pick out words or sentences from the judgment, divorced from the context of the questions under consideration by this Court, to support their reasoning. Commissioner of Income-tax v. M/s. Sun Engineering Works (P) Ltd., AIR 1993 SC 43;: 1992(4) SCC 363. The decision or judgement of a judge may fall into two parts: the ratio decidendi (reason for the decision) and obiter dictum (something said by the way). The principles of Binding Precedent apply only when the facts must be sufficiently similar and the court must be more senior or on the same level. It is only the ratio decidendi (the legal reasoning or ground for the judicial decision) which is binding on later courts under the system of judicial precedent. RATIO DECIDENDI - The ratio decidendi of a case is the principle of law on which a decision is based. When a judge delivers judgement in a case he outlines the facts which he finds have been proved on the evidence. Then he applies the law to those facts and arrives at a decision, for which he gives the reason (ratio decidendi). OBITER DICTUM - The judge may go on to speculate about what his decision would or might have been if the facts of the case had been different. This is an obiter dictum. A difficulty arises in that, although the judge will give reasons for his decision, he will not always say what the ratio decidendi is, and it is then up to a later judge to "elicit" the ratio of the case. There may, however, be disagreement over what the ratio is and there may be more than one ratio. In a judgement delivered by a court, what part is a binding precedent is relevant so as to be precise as to what is ultimately biding proposition to other courts. What the court decides generally is ratio decidendi or rule of law which it is authority. As against persons not parties to suit or proceeding general rule of law i,e ratio decidendi is binding . The rule of law or ratio decidendi is that what is applied and acted upon by the Court . The rules of law or ratio decidendi are developed by courts and are thus creatures of courts. The ratio has to be developed by judges while deciding cases before them. Statement made by judges when giving lectures are statements made in extra judicial capacities and are therefore not binding. In the course of judgement a judge may make observations not precisely relevant to deicide the issue. These observations are obiter dicta and are having no binding authority but are none the less important. These obiter dicta are helpful to rationalize law only to suggest solutions to problems not yet decided by the Court. Any ratio decidendi are amenable to distinction on different facts and thus where the meaning thereof are widened , restricted, distinguished or explained , the latest interpretation of ratio decidendi in later cases becomes authority to these state of facts and in that sense. The rule of law based on hypothetical facts is mere obiter dicta and thus not binding. Not infrequently it is difficult to find out what is the ratio decidendi in the judgement when several propositions are considered by the Court. In short ratio is general rule without which the case would have been decided otherwise. The application of the same law to the differing circumstances and facts of various cases which have come up to this Court could create the impression sometimes that there is some conflict between different decisions of this Court. Even where there appears to be some conflict, it would, we think, vanish when the ratio decidendi of each case is correctly understood. It is the rule deducible from the application of law to the facts and circumstances of a case which constitutes its ratio decidendi and not some conclusion based upon facts which may appear to be similar. One additional or different fact can make a world of difference between conclusions in two cases even when the same principles are applied in each case to similar facts. The Regional Manager and another v. Pawan Kumar Dubey, AIR 1976 SC 1766:; 1976(3) SCC 334. The general observations therein should be confined to the facts of those cases. Any general observation cannot apply in interpreting the provisions of an Act unless the Court has applied its mind to and analysed the provisions of that particular Act. M/s. Raval and Co. v. K.G. Ramachandran and others, AIR 1974 SC 818; 1974(1) SCC 424. * There is certainty in the law. By looking at existing precedents it is possible to forecast what a decision will be and a person can plan accordingly. * There is uniformity in the law. Similar cases will be treated in the same way. This is important to give the system a sense of justice and to make the system acceptable to the public. * Judicial precedent is flexible. There are a number of ways to avoid precedents and this enables the system to change and to adapt to new situations. * Judicial precedent is practical in nature. It is based on real facts, unlike legislation. * Judicial precedent is detailed. There is a wealth of cases to which to refer. * Difficulties can arise in deciding what the ratio decidendi is, particularly if there are a number of reasons. * There may be a considerable waiting period for a case to come to court for a point to be decided. * Cases can easily be distinguished on their facts to avoid following an inconvenient precedent. * There is far too much case law and it is too complex. If two judges Bench finds a judgement of a three judges Bench to be so incorrect that it can not be followed in any circumstances , keeping view of judicial discipline and propriety, the proper course is to refer the matter before it to another Bench of three judges. Pradip Chandra Parija v/s Pramod Chandra Patnaik AIR 2002 SC 296 ;(2002) 1 SCC 1 . It is impermissible for a High Court to over rule the decision of the Apex Court on the ground that the Supreme Court laid down legal position without considering any other point . High Court can not question the correctness of the decision of the Supreme Court even though the point sought before the High Court. Suganthi Suresh Kumar v/s Jagdeeshan (2002) 2 SCC 420. When a court differs from the decision of a co-ordinate bench of a Single Judge of High Court, the decision should be referred to Larger Bench. Ayyaswami Gounder and others v. Munnuswamy Gounder and others, AIR 1984 SC 1789: 1984(4) SCC 376. If a division bench of a High Court differs from the view expressed by another division bench of the same court, it is appropriate that the matter is referred to a larger bench.Rajesh Kumar Verma v. State of Madhya Pradesh and others, AIR 1995 SC 1421: 1995(2) SCC 129; Sundarjas Kanyalal Bhathija and others v. The Collector, Thane, Maharashtra and others, AIR 1991 SC 1893; 1989(3) SCC 396. Union of India and others v. Godfrey Philips India Ltd., AIR 1986 SC 806; 1985(4) SCC 369. Division Bench of Supreme Court consisting of two Judges cannot over rule the decision of a Bench of two Judges as it would be an inappropriate. Javed Ahmed Abdul Hamid Pawala v. State of Maharashtra, AIR 1985 SC 231; 1985(1) SCC 275. When there is a conflict of opinion that is when there is disagreement by one single judge with the decision of another single Judge it is appropriate that the appropriate course is to refer the matter to a larger bench for an authoritative decision. Shridhar son of Ram Dular v. Nagar Palika, Jaunpur and others, AIR 1990 SC 307; 1990 Supp. SCC 157. One Full Bench decision cannot over rule another Full Bench Decision delivered by Judges of equal strength. Shyamaraju Hegde v. U. Venkatesha Bhat and others, AIR 1987 SC 2323: 1987 Supp. SCC 321. CIRCUMSTANCES DESTROYING OR WEAKENING THE BINDING FORCE OF PRECEDENTS. 1. ABROGATED DECISIONS: A decision ceases to be binding if a statute or statutory rule is inconsistent with it is subsequently enacted or if it is reversed or overruled by a higher court. 2. IGNORANCE OF STATUTE: A precedent is not binding if it was rendered in ignorance of a statute or rule having the force of statute i.e. delegated legislation. Such decisions are per incuriam and not binding . The mere fact that the earlier court misconstrued a statute or ignored a rule of construction is no ground for impugning the authority of precedent. It is clear law that a precedent loses its binding force if the court that decided it overlooked an inconsistent decision of a higher court . Such decisions are also per incuriam. A court is not bound by its own decision that is in conflict with one another. If the new decision is in conflict with the old, it is given per incuriam and is not binding on later courts. In this circumstances the rule is that where there are previous inconsistent decisions of its own , the court is free to follow either i.e. earlier or later. To come within the category of per incuriam it must be shown not only that the decision involved some manifest slip or error but also that to leave the decision standing would be likely, inter alia, to produce serious inconvenience in the administration of justice or significant injustice to citizens. When observation of the court on a question about validity of a statutory provision which was neither raised nor argued would not be a binding precedent. Rajpur Ruda Meha and others v. State of Gujarat, AIR 1980 SC 1707: 1980(1) SCC 677. 5. DISTINGUISHING: A binding precedent is a decided case which a court must follow. But a previous case is only binding in a later case if the legal principles involved is the same and the facts are similar. Distinguishing a case on its facts, or on the point of law involved, is a device used by judges usually in order to avoid the consequences of an earlier inconvenient decision which is, in strict practice, binding on them. If a Court deems fit to follow a precedent of a superior court the proper course , in such a case, is to try to find out and follow the opinions expressed by larger benches of SuperiorCourt in the manner in which it had done this. The proper course for a Court , is to try to find out and follow the opinions expressed by larger benches of superior Court in preference to those expressed by smaller benches of the Court. If, however, the Court was of opinion that the views expressed by larger benches of this Court were not applicable to the facts of the instant case it should say so giving reasons supporting its point of view. Union of India and another v. K.S. Subramanian, AIR 1976 SC 2433;1976(3) SCC 677. Even Apex Court is bound by its earlier decisions. It is only when the Supreme Court finds itself unable to accept the earlier view, it shall be justified in deciding the matter in a different way. Income Tax Officer, Tuticorin v. T.S. Devinatha Nadar etc., AIR 1968 SC 623. 6. OVERRULING: A higher court can overrule a decision made in an earlier case by a lower court eg. the Court of Appeal can overrule an earlier High Court decision. Overruling can occur if the previous court did not correctly apply the law, or because the later court considers that the rule of law contained in the previous ratio decidendi is no longer desirable. The overruling is retrospectively except as regards matters that are res judicata or accounts that have been settled in the meantime. The Apex Court or any superior court cannot allow itself to be tied down by and become captive of a view which in the light of the subsequent experience has been found to be patently erroneous, manifestly unreasonable or to cause hardship or to result in plain iniquity or public inconvenience. The Court has to keep the balance between the need of certainty and continuity and the desirability of growth and development of law. It can neither by judicial pronouncements allow law to petrify into fossilised rigidity nor can it allow revolutionary iconoclasm to sweep away established principles. On the one hand the need is to ensure that judicial inventiveness shall not be desiccated or stunted, on the other it is essential to curb the temptation to lay down new and novel principles in substitution of well established principles in the ordinary run of cases and the readiness to canonise the new principles too quickly before their saintliness has been affirmed by the passage of time. It may perhaps be laid down as a broad proposition that a view which has been accepted for a long period of time should not be disturbed unless the Court can say positively that it was wrong or unreasonable or that it is productive of public hardship or inconvenience. Manganlal Chhagganlal (P) Ltd. v. Municipal Corpn. of Greater Bombay, AIR 1974 SC 2009; 1974(2) SCC 402. Decision of Full Bench of High Court passed after considering the local conditions and history should not be easily disturbed. Nityananda Kar and another, etc. etc. v. State of Orissa and others, AIR 1991 SC 1134; 1991 Supp (2) SCC 516 . 7. REVERSING:.Reversing is the overturning on appeal by a higher court, of the decision of the court below that hearing the appeal. The appeal court will then substitute its own decision. 8. CONCESSION:Concession made by counsel on a question of law is not binding as precedent. The Government of Tamil Nadu and others v. Badrinath and others, AIR 1987 SC 2381: 1987(4) SCC 654; State of Rajasthan v/s Mahaveer Oil Industries (1999) 4 SCC 357. 9. CONSENT: When a direction or order is made by consent of the parties, the Court does not adjudicate upon the rights of the parties nor lay down any principle. Municipal Corporation of Delhi v. Gurnam Kaur, AIR 1989 SC 38: 1989(1) SCC 101; 1989 Supp. (2) SCR 929. 10. NON SPEAKING ORDER: Non speaking order dismissing special leave petition would not constitute binding precedent as to the ratio of the High Court involved in the decision against which special leave petition to appeal was filed. Ajit Kumar Rath v/s State of Orissa (1999) 9 SCC 596. 11.SPECIFIC EXCLUSION:A judgment stating therein itself that the ratio laid down there in shall not be binding precedent or shall not be followed or relied upon , can not be treated as binding precedent. Kendriya Vidyalaya Sangathan v/s Ram Ratan Yadav(2003) 3 SCC 437. 12 .ON FACTS: If a judgment is rendered merely having regard to the fact situations obtaiing therein , the same could not be declaration of law within meaning of Article 141.UP State Brassware Corp. Ltd v/s Uday Narain Pandey AIR 2006 SC 586 ;(2006)1 SCC 479;. There is nothing in the Constitution which prevent the Supreme Court from the reversing its previous decision. State of West Bengal v. Corporation of Calcutta, AIR 1967 SC 997: 1967(2) SCR 170. An earlier decision cannot be departed unless there are extra-ordinary or special reasons for doing so. Manganese Ore (India) Ltd. v. The Regional Assistant Commissioner of Sales Tax, Jabalpur,AIR 1976 SC 410;: 1996(4) SCC 124. Non-consideration for foreign decisions. The decision of Constitution Bench which held the field a quarter of century without challenge. Reconsideration on account of non-consideration of an American decision, not cited before the bench, is not called for. Smt. Maya Rani Punj v. Commissioner of Income-tax, Delhi, AIR 1986 SC 293: 1986(1) SCC 445: ;India Electric Works Ltd. v. James Mantosh and another, AIR 1971 SC 2313; 1971(1) SCC 24. Thus , one of the tools of an Advocate to persuade a Court on the point canvassed before it, that is to cite a binding precedent, is not always without limitations and it has to be an endevour of every advocate to perform an exercise to find out the ratio decidendi of a judgement and its relevancy to the proposition put before the court in the context of the facts of the case, before the same is quoted. Prospective overruling implies that an earlier decision of the same issue shall not be disturbed till the date of the later judgement. It is resorted to mould relief claimed to meet the justice of the case. It means that relief though the Petitioner may be entitled to in law because of interpretation of the law made by the Supreme Court, the same shall not be applicable to past transactions. Frequently such situations arise in service matters or tax matters where in the person already appointed for a long time based on interpretation of a law by the Apex Court in its earlier judgment , but the same is overruled in the later judgement, and therefore the person already in public employment need not be directed to vacate the post or the tax already imposed and collected is not directed to be refunded. In normal course, a law declared by supreme court is the law assumed to be from the date of inception and prospective overruling is only an exception when the Supreme Court it self make the applicability of the ration of the judgement prospectively to do complete justice to the parties or to avoid chaos.It is therefore necessary that if a law is to be made applicable prospectively , the same is required to be so declared in the judgement when it is delivered .M.A.Murthy v/s State of Karnataka (2003) 7 SCC 517. If supreme court does not exercise such discretion to hold that the law declared by it would operate only prospectively, High Court can not of its own do so. Sarwan Kumar v/s Madanlal Agarwal AIR 2003 SC 1475; (2003) 4 SCC 147.